The 10GBASE-T standard, which defines 10 Gigabit Ethernet over twisted-pair cabling, has been around for eight years now. Recently, it has emerged as the most cost-effective option for access layer networking. In fact, prices have dropped significantly for 10G servers in the past year and the cost of 10GBASE-T channels is 30-percent lower than alternative SFP+ channels. 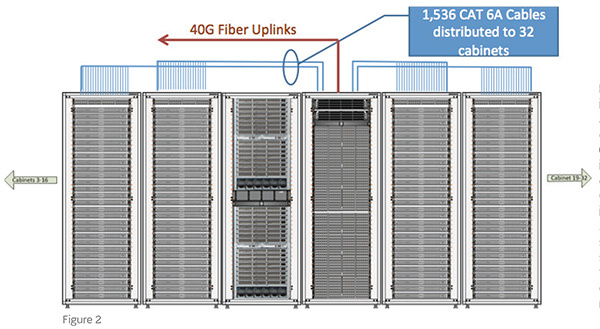 In addition, new switches have been introduced that support 10GBASE-T at lower costs and higher densities. These include the Cisco Nexus 9500 Series and Arista 7300 Series switches, both released in late 2013. These switch manufacturers and others are promoting "flatter" network architectures that remove some of the north-to-south traffic from switch to server, and replace it with east-to-west, server-to-server designs. As these new switches and architectures become widely used, it's important to understand how higher densities will affect cabling pathways. Using the previously mentioned Arista and Cisco switches in sample data center configurations, it becomes clear that the CAT 6A cabling used to support the 10GBASE-T server connections has a significant impact on the physical support infrastructure needed to deploy it. In the end-of-row configuration shown in Figure 1, a 13U Cisco Nexus 9508 switch using 10GBASE-T linecards is installed. When fully populated, the switch supports 384 ports, serving 8 server cabinets at 48 ports per cabinet. For this scenario the large volume of cabling that connects the switch cabinet at the end of the row to each of the server cabinets should be evaluated in terms of total cross sectional area as well as future expansion and additions. Figure 2 shows a larger, middle-of-row example with two 21U Arista 7316X switches, each supporting up to 768 10GBASE-T ports. At highest density, the two switches support 1,536 ports, serving 32 server cabinets at 48 ports per cabinet. Both examples highlight the importance of planning for density and cable volume, as cabinet and cable tray space becomes an issue. Only 318 CAT 6A UTP cables can fit in a standard 4 x 12-inch tray if the cables have an industry-average 0.310-inch outer diameter. 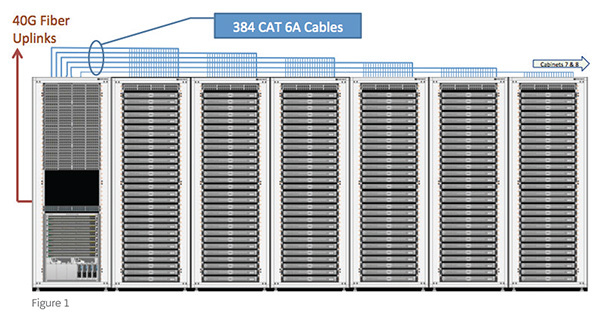 Therefore, in the 8-cabinet scenario that requires 384 cables, one would have to install a second cable tray. And the 32-cabinet scenario would require three standard trays to support average-size CAT 6A cable. These additional cable trays require extra cost and labor to install. Berk-Tek Leviton Technologies recently introduced a new CAT 6A UTP system that includes a smaller, lighter cable for higher density and better manageability. With an industry-leading 0.275-inch diameter, Berk-Tek LANmark-XTP cable improves density and reduces the total fill percentage of often over-crowded cabling pathways when compared to traditional CAT 6A UTP cable designs. In fact, LANmark-XTP fits up to 404 cables into one 4 x 12-inch tray, easily supporting the 8-cabinet example above. This reduction in cable size is especially important in existing pathways where additional channels are added and space can become an issue. The smaller cable also improves operational cooling by reducing cable bulk and congestion in cabinets and less static load. Additionally, at 38 pounds per 1,000 feet, LANmark-XTP cable is nearly 8 pounds lighter than average CAT 6A UTP cable at that length. This leads to easier cable routing and handling. The cable features noise-canceling XTP Technology to reduce incoming and outgoing electromagnetic interference (EMI) and provide exceptional alien crosstalk suppression. Discontinuities in the Mylar wrap prevents current from flowing along the length of the cable. This eliminates the need for grounding and bonding, saving time during installation and significantly reducing labor costs, while providing alien crosstalk suppression far superior to a traditional UTP cable design. LANmark-XTP cable is part of the CX6800 CAT 6A Premium+ UTP System, which includes Leviton eXtreme® CAT 6A connectors, patch cords, and high-density patch panels. The system's cable and connectivity have been independently tested and verified to exceed channel and component performance at set by ANSI/TIA-568-C.2 and ISO/IEC 11801 Class EA standards. Learn more about the CX6800 System at berkteklevitontechnologies.com. Do You Really Know the True Cost of Downtime in Your Manufacturing Plant? © 2019 Leviton Manufacturing Co., Inc. All rights reserved.